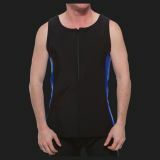 They see a swim top with a zipper down the middle that looks like the perfect swim tank for the pool or the beach. What they don't see are the inner layers of compression power binding your chest and shaping your body. We concealed the power inside so you can now enjoy your freedom without the layers of disguises. With an SPF 50 rating for UV protection, the special microfiber fabric on the outside is strong and smooth and moves with you like skin. Made in USA.